Gold medalists Gabrielle Douglas, Simone Biles, Lauren Hernandez, Madison Kocian and Alexandra Raisman of the United States pose for photographs on the podium at the medal ceremony for the Artistic Gymnastics Women's Team on day 4 of the Rio Olympic Games at the Rio Olympic Arena on Aug. 9, 2016, in Rio de Janeiro. 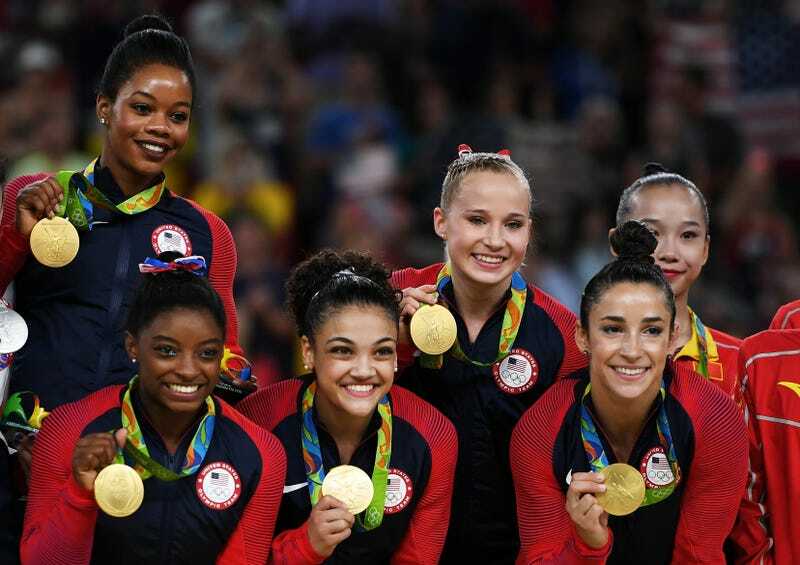 The "Final Five," Team USA's women's gymnastics team, claimed victory Tuesday, winning gold in the team competition in Rio, NPR reports, defending its title from the 2012 Games. The team, headlined by Simone Biles, crushed the competition, winning by an 8-point gap, with Russia trailing in second place. The United States' final score was 184.897 points, while Russia secured 176.688 points. According to NPR, it was the largest gap since the Soviet Union defeated Czechoslovakia by 8.997 points in Rome in 1960. The amazingly talented Biles secured her first gold in her first Olympics, and this could be the start of a rush of medals for the 19-year-old powerhouse, who is bidding to become the first gymnast to secure five gold medals at a single Olympics, CNN reports. Biles' teammates Aly Raisman and Gabby Douglas also made history that evening, becoming the first U.S. women to win three Olympic golds, the network notes. Read more at NPR and CNN.